Thank you for taking the time to start a new application or update your profile. This form was designed for use by applicants and members of our Board of Directors, Standing Committees, Associate Board, and Junior Board. The information you submit using this form will be sent directly to the Executive Director for review. Some information may be used to generate a public profile that may appear online and in our Annual Report. If you have any questions, or if you need a printable version of this form, please contact Holly Beadle, Executive Director, at hollyb@isabelshouse.org or by calling 417.865.2273. Please list Employer, Title, and Dates of Service (optional), beginning with the most recent. Please list School or Program, Degree(s) or Certificate(s), and relevant Dates, beginning with the most recent. Please list Activity Name, Responsibilities, and Dates of Participation, beginning with the most recent. Please list Organization, Role, and Dates of Service, beginning with the most recent. Please list Organization, Role, and Dates of Membership, beginning with the most recent. What words would you personally use to describe yourself, your experience, and your strengths? What do you hope to do or gain, personally or professionally, by serving on an Isabel's House Board or Standing Committee? How did you learn about the Isabel's House Junior Board? 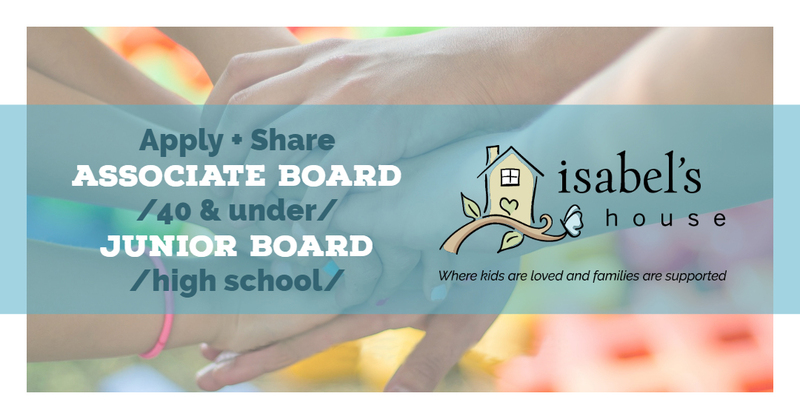 Why are you interested in serving on the Junior Board of Isabel's House? What unique skills, perspectives, and experiences do you think you'll bring to the group?